What Are the Differences Between Memory Care and Assisted Living? Memory loss doesn’t just alter the life of the affected individual; it affects everyone close to them. Coming to terms with the fact that someone you love is living with Alzheimer’s disease or another form of dementia is highly emotional, and determining the right type of care for them can feel overwhelming. First, know that you aren’t alone! Looking for a care center can feel daunting, but many resources are available to help you assess your loved one’s needs and determine the best type of care setting for them. If you are considering a residential setting, you’ll find two similar yet distinct options: traditional assisted living and memory care. Understanding your loved one’s needs and the differences between these two types of care is imperative when searching for a place where your loved one will feel safe, secure and cared for. In traditional assisted living facilities, the individual often has a private room or apartment and receives hands-on assistance with daily living activities such as bathing, dressing, grooming and managing medications. Most assisted living centers also provide meals, housekeeping, personal laundry services and a robust activities program to keep residents engaged and enhance their quality of life. Overall, traditional assisted living aims to offer a balance between privacy and independence while providing 24-hour hands-on care. Those with Alzheimer’s disease or other forms of dementia often need more supervision than is provided in traditional assisted living centers. Since individuals with dementia may act in uncharacteristic ways that put themselves at risk, specialized memory care centers offer a more secure environment designed specifically to keep them safe and support their care needs. These facilities help manage the disease with specialized staff, enhanced services and more medical care than traditional assisted living centers. As you begin to research care centers, keep your loved one’s needs, challenges and preferences in mind when considering what each option has to offer in terms of design, security, staffing, quality of life and cost. Traditional assisted living facilities often offer private apartments and/or shared suites. Accommodations typically include a bedroom, full or half-bath, living room and sometimes a kitchenette. Most centers have a variety of common spaces for all residents to enjoy, such as a living room, dining room, activities space and outdoor area. 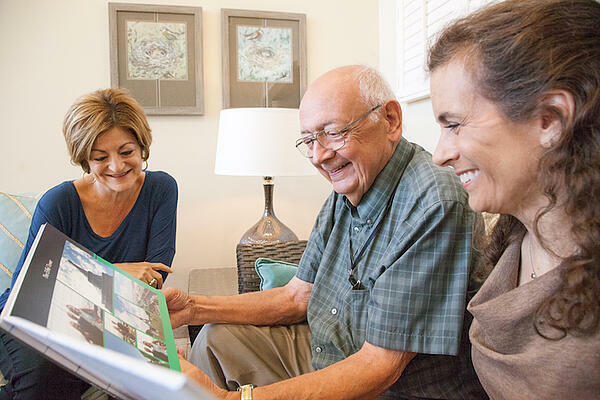 Specialized memory care centers offer private or shared suites options that are built specifically with safety, security and care needs in mind. Individuals with advanced forms of Alzheimer’s or dementia are often prone to wander, so these specialized facilities tend to be designed with wide hallways, a circular layout and designated, secured outdoor areas. Such features allow residents to enjoy the freedom and independence to move around inside or outside while keeping them safe. In addition, many specialized memory care centers put extra emphasis on offering a soothing environment to reduce overstimulation, which can increase agitation and confusion. Both assisted living and memory care centers provide safe and secure environments. However, memory care centers tend to take safety and security further with enhanced supervision and secured doors, since individuals suffering from memory loss may unintentionally put themselves or others at risk. Some memory care facilities even offer personal safety features, such as GPS-enabled tracking bracelets that notify staff of a resident’s current location within the center. This gives residents the opportunity to roam within the center while giving families the peace of mind that their loved one is safe. Individuals in traditional assisted living settings and memory care facilities usually need daily hands-on assistance with activities such as bathing, dressing and grooming. They may also need some help managing medications and eating. However, those living with memory loss often require more specialized care, due to the unique symptoms and behaviors caused by dementia. Centers that offer a team of Certified Dementia Practitioners® (CDPs®) are an excellent choice if your loved one is struggling with challenging dementia-related symptoms or behaviors. CDP is an earned credential that recognizes the highest standards in Alzheimer’s and dementia care. Certified Dementia Practitioners are trained in current research and best practices in Alzheimer’s and dementia. For example, an individual with Alzheimer’s or dementia might no longer be able to tell someone if they are in pain. A CDP is often able to assess a resident’s needs even without obvious verbal cues and may notice reactions and behaviors that indicate a person is in pain. Certified Dementia Practitioners understand that memory loss affects everyone differently, and that it can manifest in unexpected ways from day to day (or even hour to hour). As a result, they are able to provide more personalized care than that provided at most traditional assisted living centers. Assisted living centers tend to have fewer caregivers than memory care centers, since the care residents receive is basic and not too complex. Because individuals with memory loss require more advanced care, the staff-to-patient ratio tends to be higher at memory care centers. For example, while someone in assisted living may need help putting toothpaste on their toothbrush, someone living with Alzheimer’s or dementia may need to be shown – possibly more than once – how to brush their teeth. The extra time necessary to help individuals with memory loss complete day-to-day functions dictates a need for more caregivers. Meeting basic physical needs of those with Alzheimer’s and dementia isn’t enough. These individuals need the time, patience and personal attention that are only possible when there are enough caregivers to provide sufficient one-on-one care. Both assisted living and memory care centers provide a variety of activities to engage residents and enhance their quality of life. In traditional assisted living facilities, individuals are more likely to speak up about what they like and don’t like to do. Individuals with memory loss may struggle to voice their preferences. It’s not uncommon for them to become agitated or disinterested in activities they once enjoyed or start to participate in new activities they never tried before. One little-known benefit of moving your loved one to a memory care center is the comfort they may experience by living around others facing the same challenges. Being around those with similar symptoms may reduce self-consciousness, anxiety and the stigma that is sometimes associated with memory loss. Costs vary widely among traditional assisted living and specialized memory care centers. Some offer all-inclusive rates while others offer levels of care where the cost is determined by the amount of care someone needs. Due to the unique needs of those with memory loss, it’s not uncommon for specialized memory care services to cost slightly more than traditional assisted living. However, this is not always the case, so it’s best to determine your budget and investigate costs prior to choosing a center. When researching care options, consider your loved one’s individual needs and the amount of supervision they’ll require. It’s best to determine your top three or four choices, so you’ll have options if a crisis hits and your loved one needs to move quickly. Luckily, resources are widely available to offer support, encouragement and coping strategies as you navigate your loved one’s journey with memory loss. The Alzheimer’s Association is an excellent resource for information, advice and treatment options. If you think someone close to you might need specialized memory care, don’t wait for a crisis. Learning the early signs of Alzheimer’s now will help your loved one get the support and care they need when they need it.